The only Cambridge degree that combines the intellectual challenges of both arts and sciences with the opportunity for creative design. The Department of Architecture at Cambridge is an exciting place to study. Regularly lauded as one of the leading architecture schools in the world, students study under the guidance of world-renowned researchers and ground-breaking practitioners. Creativity, curiosity and strong intellectual grounding are central to the course. Our innovative design programme – delivered by tutors working at the cutting edge of contemporary architecture – is balanced with outstanding teaching in the history and philosophy of architecture, contemporary culture and urbanism, as well as construction, structural design and environmental design. Our small, friendly Department has a very good staff to student ratio, and the supportive community atmosphere gives students the opportunity to push the boundaries of the field and to extend their own abilities in exciting new directions. Facilities include a superb library, studios and spaces for larger installations, and reprographics areas and workshops. Successful completion of our full three-year undergraduate course carries exemption from the Architects Registration Board (ARB)/Royal Institute of British Architects’ (RIBA) Part 1 – the first stage in qualifying as an architect. The Department also offers a Masters in Architecture and Urban Design, which carries exemption from ARB/RIBA Part 2, and an ARB/RIBA Part 3 course (the final qualifying stage). When you have completed all three parts of the ARB/RIBA requirements, you will be able to register as an architect with the ARB. You must have an enthusiasm for both the arts and the sciences. The ability to draw and an interest in the history of art and architecture are essential, as is a knowledge of mathematics to at least a good GCSE standard. It’s not possible to study Architecture as an affiliated course (ie in one year less than usual). However, if you’ve already completed an undergraduate degree at another university and now wish to study Architecture at Cambridge as a second undergraduate degree, you can apply to study the full three-year course. (In this case, you normally wouldn’t pay the separate College fee.) Please seek advice about your application as early as possible from one of the mature Colleges. Students can opt to move to other courses within the University after Year 1 (Part IA). However, this is very rare and most architecture students stay for all three years (see above regarding professional qualification). Details about additional costs can be downloaded from the Department website. Many graduates continue into professional training, but some enter other creative fields or research. We have a long-standing tradition of research excellence, in areas such as history and philosophy of architecture, environmentally responsible design, architecture and the moving image, urban design and transport planning, and disaster relief. You’re taught in our studio – where you have your own dedicated design space – two days a week, during which you’re set projects that require you to produce models and drawings to communicate your ideas. You’re supervised on studio work in individual tutorials and group critical reviews, which encourage you to explore different approaches and develop essential design skills. The resulting portfolio accounts for 60 per cent of your overall marks each year. Lectures, classes and visits to completed buildings or buildings under construction/restoration cover the rest of the curriculum. In addition to the two studio days, in the first year you typically attend six or seven lectures each week; and three classes and three small-group supervisions each fortnight, for which you’re required to complete essays and undertake preparation. The studio work introduces the possibilities of architecture, with an emphasis on understanding and developing proficiency in traditional modes of architectural representation – models, collage, perspectives, elevations, plans and sections. You also master basic CAD skills, used in studio presentations. A study trip abroad is typically offered in the Easter vacation. Assessment is through coursework and written examinations. You choose from various options for studio work, with projects ranging in scale from mapping studies and interior interventions, to reasonable-sized buildings. Emphasis is on integrating the technical skills learnt in Part IA and in the ongoing Part IB lectures with your studio output. A voluntary study trip is usually offered. For the first, you submit two essays and sit a written examination. The remaining three papers are assessed by a written exam in each. You choose from three studio options which vary in approach but all require you to produce a building design at the end of the year, the technical realisation of which is allied to a coherently framed conceptual approach. Again, a voluntary study trip is usually offered. A written dissertation of 7,000-9,000 words on a topic of your choice accounts for the remaining 20 per cent of your marks. For further information about studying Architecture at the University of Cambridge see the Department of Architecture website. Please note that Art tends to provide a better preparation for our course than subjects such as Design and Technology. See Architecture: Subject Requirements and Typical Offer by College for College-specific requirements/preferences. All undergraduate admissions decisions are the responsibility of the Cambridge Colleges, so please check College websites for further details. All applicants invited to interview are expected to show a portfolio of recent work at the interview but this isn't expected to be work of an architectural nature (eg plans, sections etc). Admissions Tutors want to see something that illustrates your interests, experience and ability in the visual and material arts. This may include drawings, paintings, sculpture and/or photography may also be included. It's usually sufficient for three-dimensional work to be exhibited in photographs. A sketchbook with ongoing drawings is extremely helpful and applicants are encouraged to take one to the interview. It may be in any media (pencil, charcoal, crayon etc) and should include a variety of subject matter. The work can be material prepared for school-leaving examinations but creative work executed outside formal courses is also welcome. Portfolio requirements vary from College to College. Please see the Department website and individual College websites for further guidance. All applicants for Architecture are required to take written and practical assessments at interview. You do not need to register or be registered in advance for the assessments at interview – the Colleges provide details of arrangements in the letters inviting applicants to interview. Course website - Explore Architecture in more detail on the course website. Applying for Architecture - Information about applying to study Architecture at Cambridge. The Course - An overview of the Architecture degree at Cambridge. 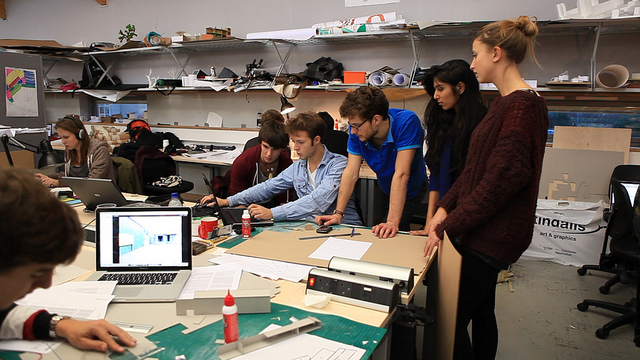 Teaching and Assessment - Read about how Architecture students are taught and assessed. Facilities - Information about the studio, workshop, digital, and library facilities in the Department. Student Life - What life is like as an Architecture student at Cambridge. Careers - Destinations available to Cambridge Architecture graduates. ArcSoc Student Architecture Society - Find out more about the University Architecture Society.